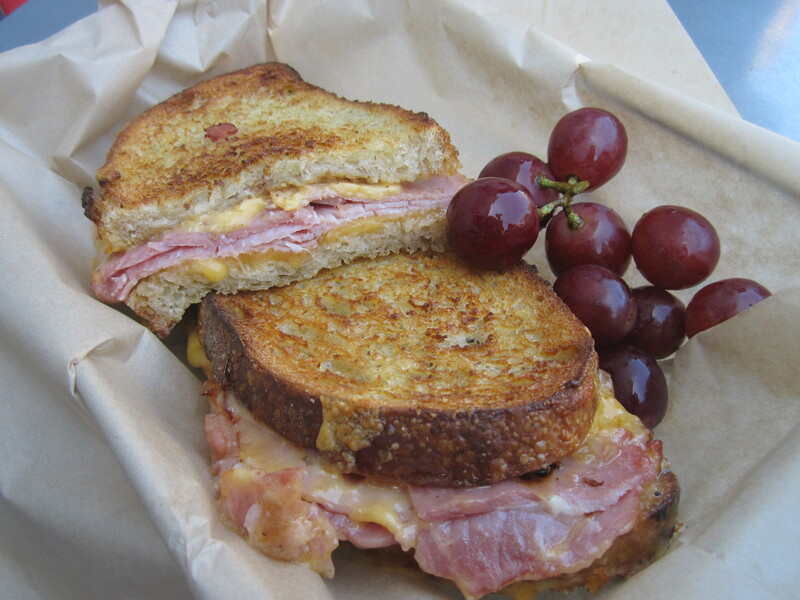 Presenting the Piglet from The American Grilled Cheese Kitchen – a preview of the deliciousness that is Outside Lands. Photo by Katherine Hamilton. Now, another thing that San Franciscans do particularly well is mobile food. The trend has been popular for decades in California, particularly in Los Angeles and Oakland, where you can find at least one taco truck on every block in some neighborhoods. As a resident of the East Bay, I’ve tried dozens of taco trucks in Oakland and a couple of them rank highly on my list of favorite places to eat—plus they’re cheap! The newer fad of gourmet food trucks plays on that same concept of quick, delicious and affordable bites, while expanding past the traditional constraints of tacos and burritos. The food vendors at Outside Lands won’t be selling out of trucks per se, but rather out of booths. There will be a total of at least 60 food and wine vendors. It’s an excellent opportunity to get a sampling of what some of the Bay Area’s finest restaurants have to offer, without having to wait for a table and pay for tip. The American Grilled Cheese Kitchen (the eventseekr staff favorite pictured above) will be selling your favorite food from kindergarten, only substitute the Kraft for fontina and add Gruyère, gold potatoes, melted leeks, mushrooms, caramelized onions and thyme butter. Andalu, a popular spot for tapas in the Mission, will be offering its popular fried mac and cheese. Charles Chocolates, a great San Francisco chocolatier, will be selling organic s’mores and French-style hot chocolate. Flour + Water, famous in the Mission for its pizza and pasta, will instead be taking a new approach at Outside Lands as a salumeria, serving porchetta sandwiches and cucumber-melon spritzers. Another Mission favorite, Ti Couz, closed on May 15 after enjoying years of popularity, but you’ll have one last chance to try their crepes at Outside Lands. And for those who need a caffeine buzz, you don’t have to resort to chain coffee shops; Philz Coffee and Ritual Coffee, two of San Francisco’s most prized coffee houses, will be at your disposal. There’s also an equally vast array of wine vendors, but I’m underage and know nothing about that, so you’re on your own on that front. To see a full list of food and wine vendors, take a look here. If you still haven’t satisfied your craving for mobile food, be sure to check out San Francisco’s Off the Grid, a traveling troupe of food carts that makes regular rounds around San Francisco and Berkeley. Friday is by far the best day to check out Off the Grid, when from 5pm-10pm in Fort Mason Center, around 30 food trucks and tents gather in a single lot to tempt your taste buds. My personal favorite is Senor Sisig, which serves up Filipino-infused tacos and burritos (get the stewed pork!). For a complete schedule and list of vendors, visit their website. The Off the Grid Corral. Photo provided by Off the Grid. Also, if you didn’t manage to snag tickets for Outside Lands but still want to enjoy a day in the city, there are several other equally enticing events happening that same weekend. The Yerba Buena Center for the Arts is hosting the 18th annual Pistahan Parade & Festival from August 13-14, a celebration of Filipino culture complete with food, music and dancing. There will even be an adobo cook-off! In addition, August 13 marks the opening of the new Images in Dialogue exhibit at the San Francisco Museum of Modern Art, which features drawings by contemporary Bay Area artist Andrew Schoultz in response to Swiss Modernist Paul Klee’s paintings. Also, on Sunday, Wil Campa y Su Orchestra, a Cuban big band group, and Luisa Maita, a Brazilian samba singer, will play at the Stern Grove Festival for a free show open to all. So what are you waiting for? Make plans to head to the city this weekend! Eat, drink and be merry! Although of course, “eat” is the most important part of all!